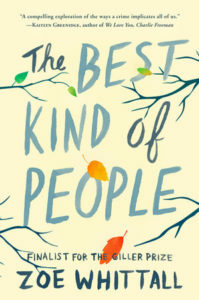 Zoe Whittall’s The Best Kind Of People looks at what happens when a respected father, husband and teacher in an affluent suburb is accused of sexual misconduct with students at his school. George Woodbury is arrested and put in jail while awaiting trial, leaving his shocked wife, daughter and son to carry on as they wonder whether he is guilty of the crimes of which he’s been accused. I got sucked into The Best Kind Of People early on, as the Woodburys’ lives unravel and each one breaks under the stress of the accusations. Wife Joan tries to be strong for her kids, but her faith and trust in her husband are deeply shaken as she comes to terms with her own doubts about his innocence. Daughter Sadie, a senior in high school, is ostracized by her classmates and turns to marijuana and a crush on an older man to escape her own disappointment in her father. And son Andrew, who has moved away and become a lawyer in Manhattan, has his own demons to wrestle with as his visits home to see his mother unearth painful memories of being a closeted teen. The book raises the question of how well we know the people we love, and what secrets might they be keeping? How would we react if we learned those secrets? Could we forgive them? The Best Kind Of People had promise but ultimately didn’t live up to its potential. I found some of it to be pretty unrealistic, such as a subplot where the boyfriend of Sadie’s boyfriend’s mother decides to write a novel about the scandal and barely conceals Sadie’s identity as one of the characters. (Who would do that?) Some threads were picked up and dropped with no resolution, like that involving Andrew and his former coach and secret boyfriend. And the group of women (!) who defended George unconditionally and blamed the teenage victims was a little hard to take. The resolution of George’s guilt was rushed and confusing, as it ignored several of the original complaints against him with no explanation. My verdict: strong start with an intriguing premise, but too many holes, unanswered questions and unrealistic characters. It was a quick read that kept my attention but it ultimately didn’t hang together well and came to an unsatisfying conclusion. I listened to The Best Kind Of People on audio, with narration by Cassandra Campbell. Campbell as always does a good job of differentiating voices and creating dramatic tension in her storytelling. I have written before that she tends to over-enunciate certain words, and this time was no exception, which I found a little distracting. I also don’t love her portrayal of moms – they always seem nagging and manic. But like I said, this audiobook kept me interested and entertained.